Clomiphene citrate is a selective estrogen receptor modulator [SERM] that helps women to achieve pregnancy. It acts on the gonadotropin-releasing hormone [GnRH] that helps to produce and release more pituitary gonadotropin - luteinizing hormone [LH] and follicle-stimulating hormone [FSH]. LH helps to produce testosterone. FSH is involved in stimulating the spermatogenic tissues in men as well as ovarian follicular development in women, which results in the release of one or more eggs for conception. Women who suffer from anovulation [when the ovaries do not release an egg on a monthly basis] due to Polycystic Ovarian Syndrome - PCOS [when there may be cessation of periods, irregular periods, or heavy bleeding due to ovarian cysts], are prevented from conceiving because of their medical condition. Clomid, the "fertility drug", takes care of this. Due to increased ovulation, such women may give birth to twins, or even triplets. This medication is sometimes prescribed to men who face fertility problems because of low sperm counts. Clomiphene not only increases the sperm count in such individuals, but also increases the sperm motility [ability to swim over to an egg], which helps in fertilizing the egg. 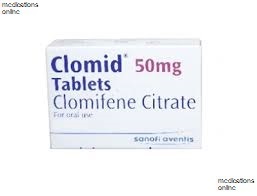 Before taking Clomid, make sure you have informed your doctor about the following health conditions if any: pregnancy, history of liver disease, pituitary gland tumor, uterine fibroids, endometriosis, ovarian cysts not related to PCOS, any untreated issue with adrenal gland or thyroid, abnormal vaginal bleeding and a couple of others. The medication shouldn’t be used by women who are already pregnant or about to conceive. 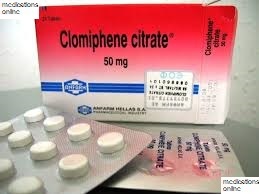 Clomiphene may also pass into the breast milk and bring harm to a nursing child, or slow down lactation in women. If Clomid is used for more than three cycles of treatment, there is an increased risk of ovarian tumor development, so keep that in mind. Take the dose exactly as prescribed. It can be taken with water. For women the initial dose may be 50mg a day and the medicine has to be taken on day 3, 4 or 5 of the woman's menstrual cycle for 5 days. The doctor may increase the dose, if need be. Most women conceive within the first 6 months of Clomid therapy if that does not happen, consult your doctor. In men, since sperm maturation takes long, treatment with Clomiphene has to be taken for 6 months at least. It's normally a once-a-day dose. If you miss a dose, check with your gynaecologist, but don't double your dose. Weight gain, or conversely loss of weight. An allergic reaction such as:- rash, hives, labored breathing, swelling of the lips/tongue/face, or difficulty in swallowing means that you should stop the medicine and ask your doctor for help. Overdose symptoms can include: blurred vision, nausea, vomiting, flushing, or abdominal/pelvic pain. US residents can call the US national poison hotline at 1-800-222-1222. If the victim collapses or stops breathing, call local emergency services at 911. There are no known/documented drug interactions with Clomid, but your doctor would be able to tell you more. After you buy Clomid, store it at a room temperature between 15 C-30 C, safe from heat, light and dampness out of reach of children and pets. Before treatment begins, patients must inform the treating doctor about their complete medical history, especially if there is any undiagnosed vaginal bleeding, ovarian cysts/enlargement not due to PCOS, uterine fibroids/bleeding, brain tumor, liver/kidney disease, thyroid/adrenal gland disorder, endometriosis, any other serious disorder, and even if you think you might be pregnant. As soon as a woman conceives, Clomid therapy should be stopped. Lactating mothers must consult their doctor before taking this medicine. Exposure to heavy metals such as lead, X-rays, chemotherapy, pesticides, and insecticides, can lower sperm production.